Emergency department information system is a computer system which is used by emergency response departments to track emergency department patients and support other aspects of ED workflow. These systems are generally used to facilitate the delivery of patient care, conform to relevant data interoperability standards and comply with applicable privacy and security constructs to ensure the secure availability of relevant healthcare information. Globally adoption of technology in healthcare practices and shift towards patient centric approach is expected to remain key growth driver during the period of study. This report identifies the Emergency Department Information System Market size in for the year 2015-2017, and forecast of the same for year 2022. 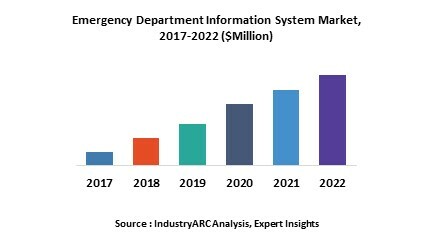 It also highlights the potential growth opportunities in the coming years, while also reviewing the market drivers, restraints, growth indicators, challenges, market dynamics, competitive landscape, and other key aspects with respect to Emergency Department Information System Market. Geographically North America dominated the Emergency Department Information System Market owing to well developed & established healthcare industry and higher penetration rate of such systems into healthcare practices. North America was followed by Europe and Asia-Pacific as the second and third largest markets for emergency department information system. It is also estimated that North America is estimated to grow at the highest CAGR during the forecast period, driven by increasing healthcare expenditure, and increase in the number of individuals with insurance cover in the U.S, rise in aging population, and the increasing use of data-driven technologies in this region. 16.2. Allscripts Healthcare Solutions, Inc.